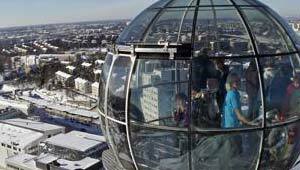 Skyview is a relatively new attraction in Stockholm and it makes use of one of the city’s most unusual landmarks. The Ericsson Globe is technically the world’s largest spherical building and Skyview is a sort of ride which is bolted onto the outside of the dome. It reminded us of the London Eye, but Skyview is not a wheel with multiple pods, simply two pods which travel to the top and back. The journey is over quite quickly, but the view is stunning and it’s certainly an unusual way to sample the cityscape of Stockholm. It almost goes without saying, but make sure you go on a clear day though to get the best out of your trip. On a good day, you really can see for miles. Skyview has been very popular since it was opened in 2010. In its first year it had 160,000 travellers and as such, booking ahead is recommended. You can book tickets here but another option is to ride for free with the Stockholm Pass. Skyview is open in the Spring, Autumn and Winter, Monday to Friday from 9am to 6pm and on Saturdays and Sundays from 9.30am to 5pm. There are extended opening hours in the summer. Adult tickets are 130 SEK (2011 Prices). The photographs on this page were taken by Soren Andersson. You can use the Metro to get to Skyview. Take number 19 or 29 to Hagsätra or Högdalen, and get off at ‘Globen’ station.